A sedentary lifestyle and lack of regular physical activity can cause weakness. The weakness comes from disuse and can lead to muscle atrophy. So, what is muscle atrophy and what can be done to reverse it? Muscle atrophy is the loss or decrease of muscle mass. The synonyms for it are muscle wasting, muscle loss, muscle catabolism, muscle withering. The cause of muscle atrophy is a lack of use of the muscle or a disruption of the nerve signals to the muscle. It is seen in many conditions, especially with cachexia in cancer and HIV/AIDS. The cure for muscle atrophy is using the muscle, most easily through exercise and being active in normal daily activities. When the nerve to a muscle is damaged, it can no longer trigger muscle contraction that produces muscle activity. The body is very conservative and what isn't used is recycled. Without the nerve triggering muscle contraction, the body believes the muscle is no longer needed and it breaks it down, the muscle atrophies. With neurogenic muscle atrophy, the muscle must be artificially exercised using functional electrical stimulation in order to preserve muscle mass. With muscles, it is definitely "Use it or lose it." If you have been exercising and being active, muscles will grow to meet the need. But as soon as you stop using a muscle, the body doesn't want to expend energy feeding it and maintaining it, so it begins to break it down and recycle it. Your muscle decreases in size as well as in strength. The cure for disuse muscle atrophy is using the muscle, first with normal physical activity, getting up, moving around, lifting and carrying. Dedicated exercise will also reverse muscle atrophy and stimulate the muscles to regrow. So long as the nerves are intact to the muscles and the body is well-nourished, muscles can regrow. Think of how bodybuilders such as Arnold Schwarzenegger go through extremes of building muscle, but as soon as they stop working out, their muscles shrink back to normal size. It is a big concern in medical care to keep patients active and mobile as muscle atrophy occurs very quickly when someone is bedridden or a limb is immobilized. If you have ever had your leg in a cast you know how fast you lost muscle mass. In some cases, they have to put on a new cast because the muscle has shrunken so much that the cast is loose after a couple of weeks. When in the hospital, you are visited by physical therapists and occupational therapists with the goal of keeping your muscles exercised so they will not atrophy. When considering the type of muscle atrophy that can develop from lack of physical activity due to joint pain and limited range of motion, we refer to the disuse type of muscle atrophy. 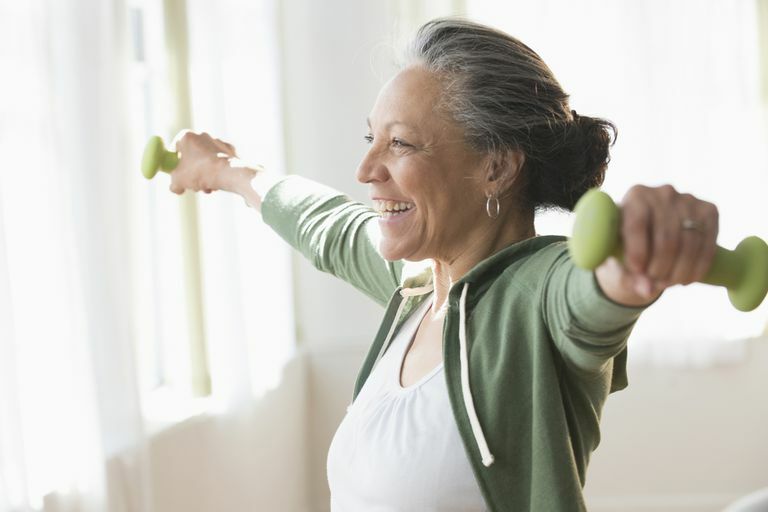 It's somewhat of a vicious cycle: arthritis pain leads to decreased physical activity, which leads to muscle atrophy. But it's important to know that the type of atrophy caused by inactivity can be reversed with exercise. If you notice that you have muscle atrophy, talk to your doctor. You will likely need to develop an exercise program and stick to it. Muscle atrophy. MedlinePlus. Accessed 5/31/11.